DiscouNNtExtensi is one more suspicious advertisement-supported program you need to beware of. This application can be installed onto the operating system and affect the popular web browsers without your consent. As our researchers have found out, it is the bundled installrex installers that are usually responsible for the distribution of this adware. If you launch the bundled installer, it may connect to veteransunbestlove.info, and enable the silent installation of the unreliable extension. As you must realize yourself, silent programs are more difficult to locate and delete. Nonetheless, you can and you certainly should remove DiscouNNtExtensi. 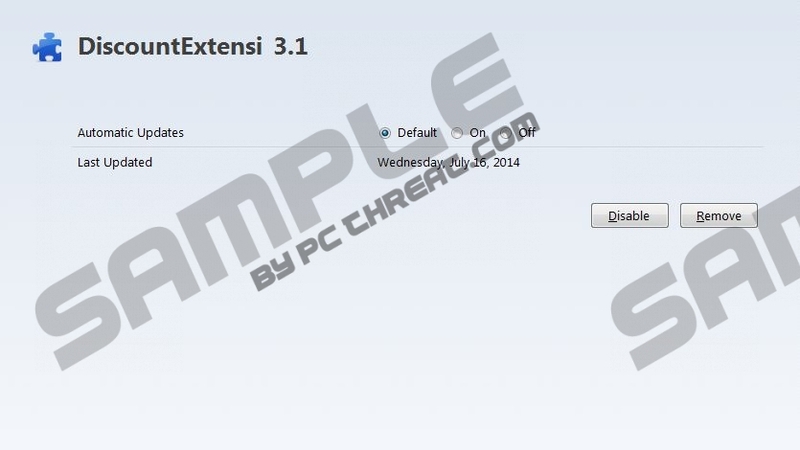 Even though DiscouNNtExtensi may be presented by different parties, including Software Informer (discountextensi.software.informer.com), we do not recommend trusting or running any of its versions. The program has been designed to conceal itself and secretly learn more about you. Simultaneously, the program acts as a mediator between suspicious adware servers and your computer. Unfortunately, this means that different pop-up and banner ads may show up on your browsers and promote the unreliable services of unfamiliar parties. Virtual security researchers indicate that if you do not delete DiscouNNtExtensi ads, it is possible that security backdoors might be opened up. AllTubeNoAds, AllSaver, PriceKeaper, and other browser extensions promising you saving deals or other offers work just like DiscouNNtExtensi. All of these programs are distributed illegally by installrex installers, and all of them are capable of enabling the connection to remote adware servers. This is the main issue related to these ad-supported programs. If you do not delete adware, the connection to advertising domains will be created, and misleading offers will start flooding. You should not click on DiscouNNtExtensi ads, let alone trust the services they promote. If you install freeware presented by the flooding ads or random updates, more disturbing applications, which you will need to delete eventually, may enter the PC. Are you experienced with malware removal? Even though DiscouNNtExtensi is not a dangerously malign program, it certainly is not reliable, and so malware researchers suggest immediate removal. The first thing you can do is complete the instructions below as they will help you delete DiscouNNtExtensi from the PC. Do not stop at this point because adware components may remain active. What you should do is install an automatic malware remover/Windows protection tool to delete existing threats and activate reliable Windows protection. Make sure you install legitimate and reliable security software because the web is filled with fake malware removers which may be more dangerous than helpful. Click Start on the Task Manager to open a user menu. Now open the Control Panel and select Add or Remove Programs. Right-click the program you wish to delete and choose to Uninstall it. Right-click on the Metro UI menu and select All apps to open the Apps menu. Quick & tested solution for DiscouNNtExtensi removal.